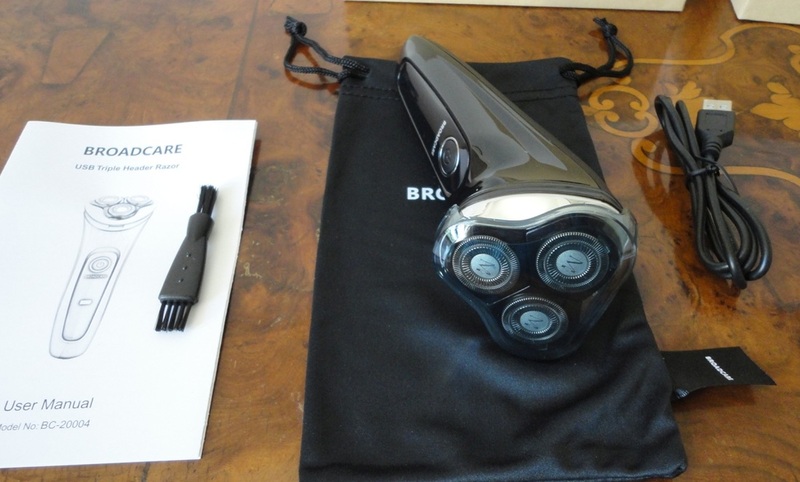 My husband has been using this shaver for about a month and really likes it. For years he has been shaving strictly with disposable blades so I wasn't sure how he would react to an electric razor. He started with dry shaving, nursing a designer stubble and being very careful over his neck where the skin is a little looser than it used to be, but gradually his confidence has soared and now it's the only razor he reaches for. The ability to use it with shaving mousse and gels and over damp skin is a big part of that. Versatile, effective and comfortable to hold with an ergonomic body that is lightweight but solid. On the back there is a flip-down trimmer for sideboards. 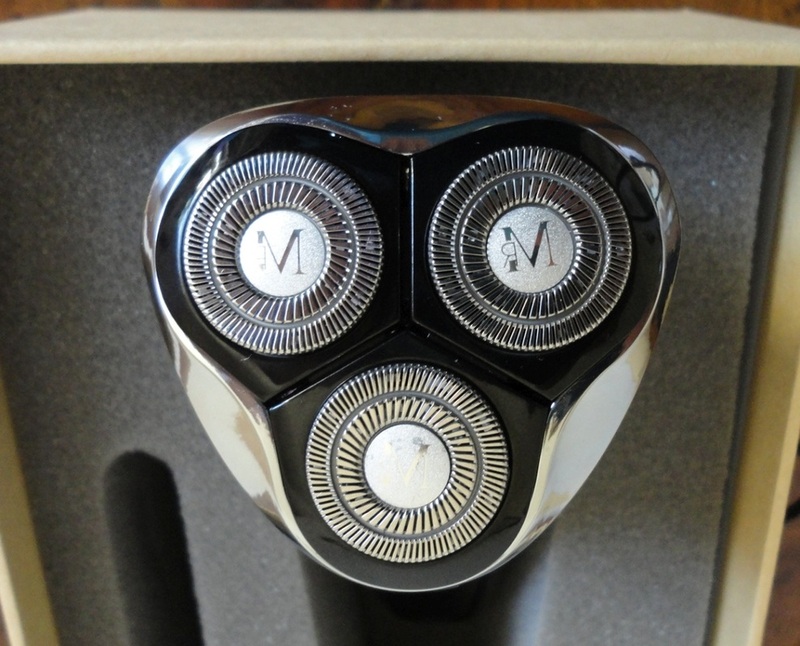 On the front the single on/off button and a backlit indicator which turns red when less than 10% of battery charge is left (so you have enough to finish shaving for the day!). The three floating heads move independently and feel very comfortable on the skin. I can vouch that the results are very pleasing. 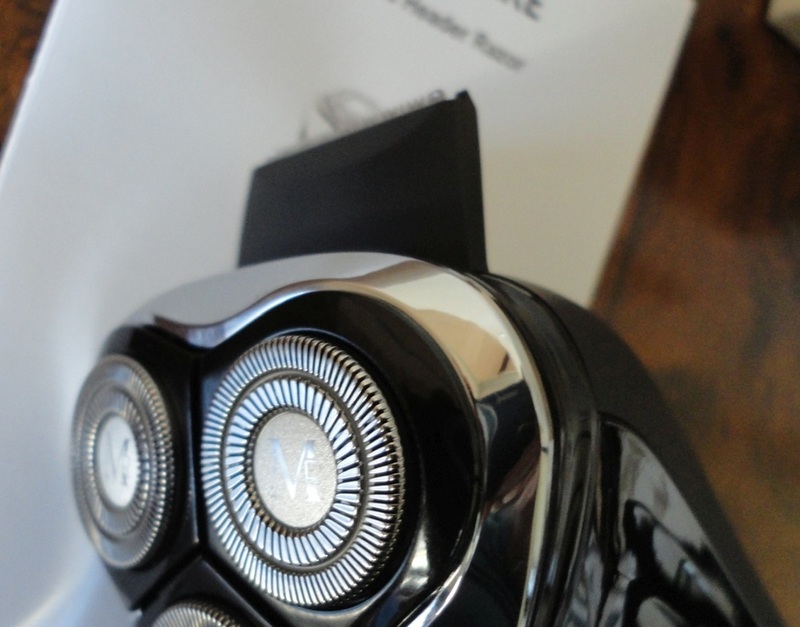 The shaver is well designed and really easy to clean. The top section flips open to allow cleaning underneath the heads with a small brush provided in the box. The whole razor can also be rinsed under the tap, and is fully waterproof but the manual says it should not be used in the shower. The storage bag is a nice extra. The other great thing is that it has an integral battery rechargeable via USB cable (also included) simply using the same USB port as a cell phone. A full charge takes 8 hours and gives about 1 hour and 15 minutes of autonomy. I find these new USB-rechargeable appliances very convenient and also lighter without the extra weight of batteries. 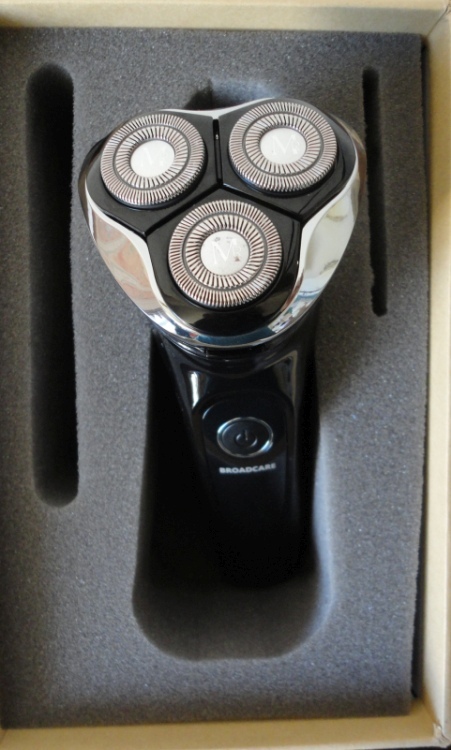 So, an ergonomic, easy to use, efficient, comfortable electric shaver with a great design, at a very affordable cost. My husband is really pleased with it. 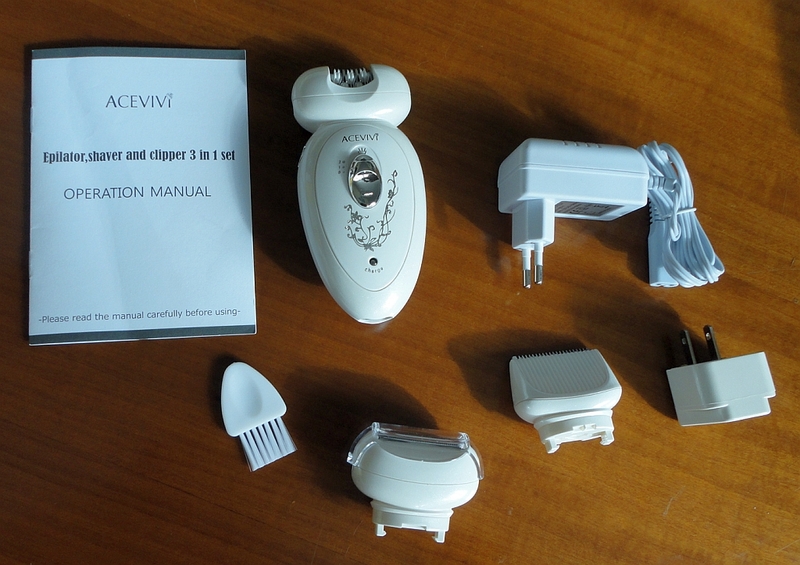 My first epilator, and I have to say I really love the concept. 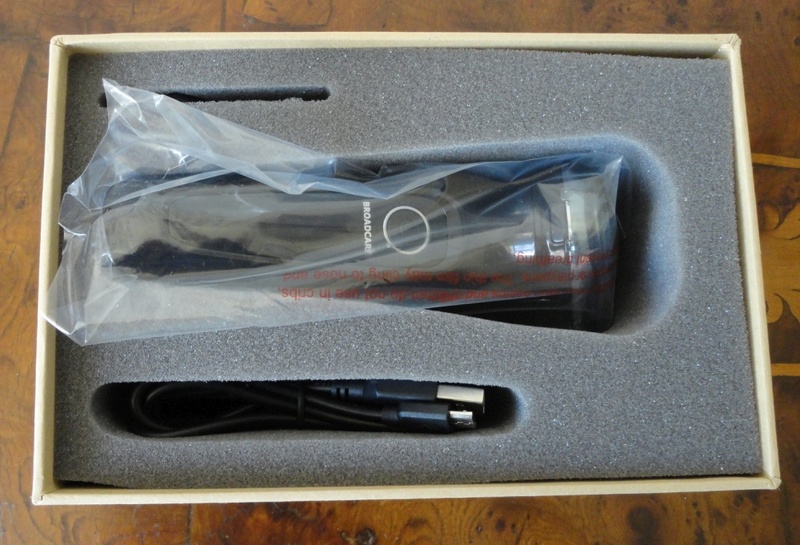 This 3-in-1 device was sent to me for evaluation, and I wasn't sure what to expect. As it turns out, it's better than I expected: it's light to hold, easy to use, with a quite ergonomic shape so it doesn't slip, and it works well. The three different heads are a bonus. 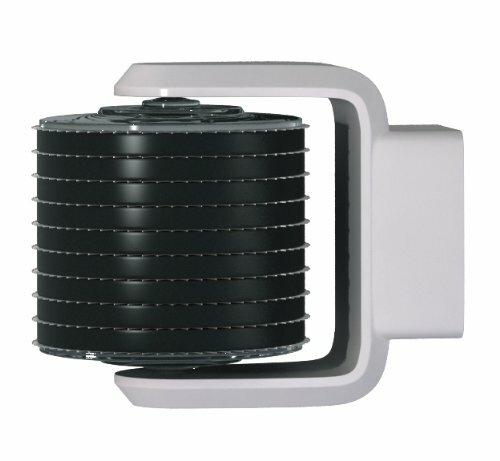 The epilator attachment has a very rounded, sleek shape and slides over the skin effortlessly. With a Slow and a Fast speed, you have a choice of action. I tend to use the fast speed for the legs and armpits and the slow for the bikini area. It seems to work on hairs of all lengths (within limits, of course), but the ideal is around 3-4 mm. Don't expect a totally smooth result the first time around. For me it's been a gradual process as I had to get used to the slight plucking sting, and I found that it takes quite a few passes to remove everything. However, after three sessions, my legs are really smooth and the best part is that it slows down regrowth considerably. So it pays to be patient the first few times; after that, it gets a lot quicker and more efficient. Over time, I have tried every known technique for hair removal, my least favourites being hot waxing (got burnt really badly the last time), and creams (because of the smell and the chemicals). Normally I shave in the shower but never again. 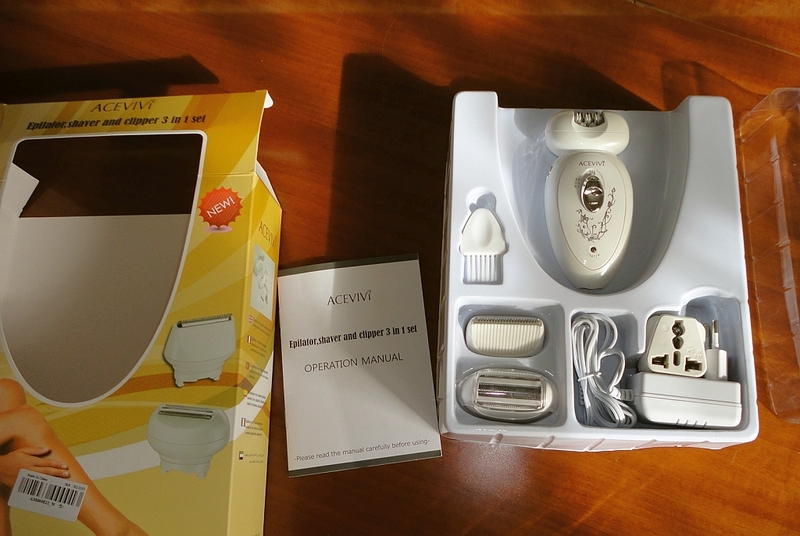 This epilator has been a delightful revelation, and I was stunned to see that there were no red marks or irritation, even in the most delicate areas. It's intended for use on dry skin but the heads can be rinsed under water, once detached from the main body. The shaving head gives very good results, and the trimmer removes a lot more than I thought, almost a close shave. There is a small brush to facilitate cleaning. Charging is slow (10 hours) but I can use the device twice on one charge. The other weak aspect is the packaging; a rigid box with lid would be ideal, instead of the soft cardboard box that needs to slide sideways. UPDATE: I originally found this Epilator lovely to use. I have changed my initial positive star rating because of issues with the battery. After getting gradually weaker, now the battery is dead. The device has stopped working after a year of very light use. I see that this model is no longer being sold. I have no experience of the newer models, but if they are anything like this one, I can't really recommend this purchase, unless you are looking for a cheap, short-term epilator. Offered to me to sample and review, I find this very portable skin buffer delightful. I started using it two weeks ago as a welcome addition to my dry-brushing routine, which is difficult to do on the face. The two brushes that come with the Pixor work very well on delicate skin and I am very happy with its gentle but effective action. It runs on 2 AA batteries (not provided), which are really easy to install. Just as well, because it is recommended to remove them after each use. The body of the appliance is light and well shaped, easy to hold and manoeuvre, and the different heads can be removed and exchanged with no fuss at all. They simply pull straight out and push down in place. There are seven heads: two brushes of different depths, two sponge applicators for make-up and creams, two buffing ones (one is mildly abrasive, the other is made of pumice stone and suitable for small calluses). I would not tackle a hardened callus with it as the power from the batteries is too feeble to do much more than a surface smoothing. The seventh accessory is a massaging head with 4 small balls which delivers a very pleasant, mild, surface massage (great for face and neck). The heads can be washed under tepid running water and left to dry before storing, but the body of the appliance must not be immersed in water, for obvious reasons. For my fragile skin, all the accessories are suitable for face and neck, except the pumice stone, which works best on the soles of the feet, kneecaps and elbows. Also please use the pink buffer with caution, it's easy to overdo it. If this grooming tool has a weak point, it is a certain lack of muscle. If you press hard, the rotating action slows down, but that could be seen as a safety feature. Because it is so gentle in action, it is perfectly suitable for all parts of the face and neck. The packaging is a little plain but effective to hold the various heads without crushing them. It could be improved by making the box a bit sturdier and adding a top lid, but at this price level, it's probably not feasible. I would recommend this massager as a perfect starter set and ideal for first time use, as it is suitable for inexperienced hands. 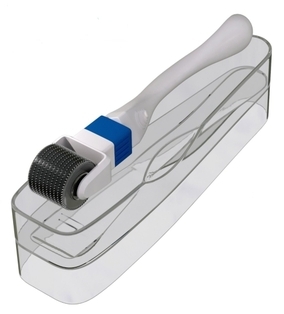 The gentle exfoliation possible with its two brushes can be very beneficial to improve the look and tone of facial skin, and the fact that it's so easy to use would certainly encourage someone who would not normally bother, male or female. My husband has started to use it as well. 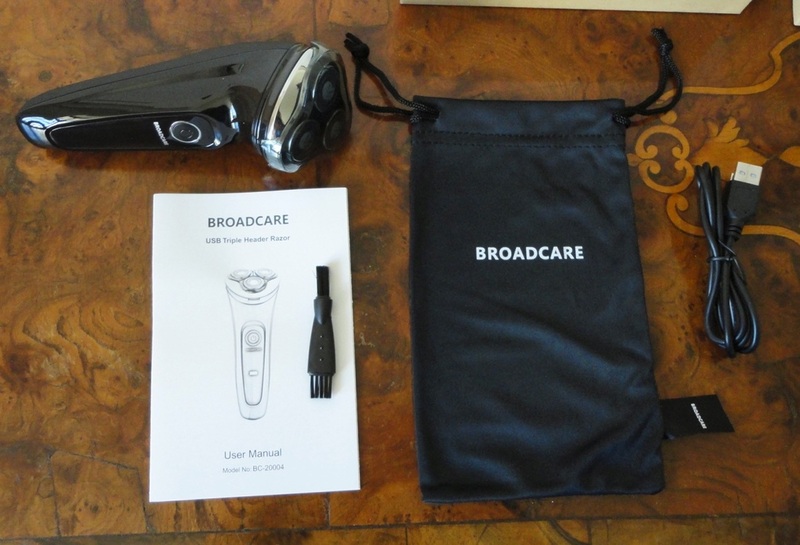 I love this massager and use it daily except for when I use a derma roller. I find that it removes older skin cells very gently, lathers up facial cleansers and helps serums and creams to sink in, which in turn makes them more effective. A lovely beauty accessory which works well and safely, and the price is really quite affordable. 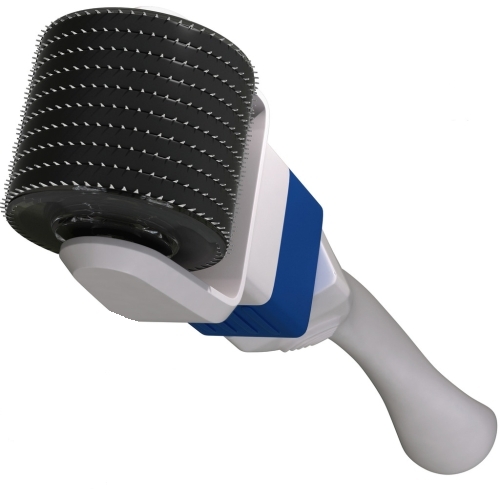 When I was offered a sample Derma Roller to test-drive on my person, I looked into it and decided that the potential benefits were too great to ignore but I was still fairly, well, scared. Having watched some pretty gruesome videos, I let the thing sit in my bathroom for a few days while I deliberated. And then one day my husband walked in, smelling strongly of pharmaceutical-grade alcohol, and told me the Derma Roller was brilliant. Of course, being a guy, he had just grabbed it and started rolling, clueless as to procedure and precautions (well, not quite ... at least he had disinfected with alcohol). And I, of course, being a woman, read him the manual twice and handed him a serum. We have been using the Derma Roller for six weeks and are very happy with its carrying powers, meaning it makes everything you apply afterwards penetrate more. To me that is its most useful role. I have no intention of turning my face into a pulpy, bloody mess and I am convinced that it is not necessary to achieve good results. I am careful to follow each skin-rolling session with an application of natural skin care products. A good serum first, then watermelon oil, seaweed cream or aloe vera gel, the purer the better and, of course, avoiding any of the chemical-laden, top-name face products. I don't find the process painful but I did notice, on my second try, that rolling over my temples made me feel queasy, so I don't roll there now. The forehead is more sensitive than the rest of my face and I am careful to avoid the immediate circle around the eyes but, other than that, it is not sore. I would never use numbing cream, the use of which has been linked to nerve damage. After rolling, my face is slightly pink and tender for a couple of hours but I never draw blood. As compared to other rollers, the Derma Logi roller has a much higher number of very fine needles and is a well-constructed tool with a curved handle that is easy to hold firmly. I like the pivoting head and feel very much in control of the direction and pressure. I have tried it on my legs but, for cellulite, I would need the 1.0 mm needle length head. As for results, I have been using it once a week to give my skin time to adapt. It is encouraging to see the money-back guarantee but I am not even close to the suggested ten uses. I have noticed a general glow and tighter feel to my face, and some nasty age spots are starting to fade. Given my cautious approach, I would expect to see more quantifiable results in another month, but I am very happy with the improvement so far. UPDATE: Two months on from my original review, I really love my Derma Roller! My skin has become visibly tighter, smoother and nasty pigmentation stains are really fading. I use it every five days, following with the amazing serums and moisturizers I am testing. I have refined my skin preparation: alcohol on the roller but not on my face (too drying). Instead I wash with a gel cleanser, rinse with warm water and pat dry with a disposable tissue. I roll my skin thoroughly but not aggressively, resulting in visible “pinkyness” and tenderness which last for a day or so (comparable to a mild sunburn). I really believe it lets my skin care products work 100% better. I have been using the Derma Logi 0.5 mm derma roller on my face and neck for nearly six months, and am really pleased with the results. So the next logical step was to try the 1.0 mm. I received my replacement head a week ago, and have been targeting the cellulite on my legs and buttocks. As usual, I went easy the first few times, giving my skin a chance to adjust, and have already noticed a definite improvement. I wipe my legs with alcohol, then roll away in all directions for a few minutes. My skin does not get all red and bloody-looking as in some gruesome videos you may have seen. Perhaps I am missing out on some ultimate skin regeneration, but I prefer to just prep the surface for my usual anti-cellulite gel, and use the roller's action to drive the gel deeper so it has a better chance to reach the problem areas. I'm not sure about the science, but my results are very promising. My thighs already look smoother and firmer than when I was using the gel by itself. On a large surface like legs and belly area, I really notice how the swivel action of the head facilitates a smooth action, without fear of catching an edge and getting cut. The replacement head slots straight into the blue section of the handle. I had a bit of struggle the first time I tried to remove the original head but eventually managed, after soaking the whole thing in very hot water. Given the pricing of these items (currently the cost is the same whether you buy the entire roller or just the replacement head), it makes sense to me to buy a whole new roller and save yourself the chore of switching heads, however, this could change. I am delighted to have been sent this replacement head to test and review, and I might even try it on my face, although the 0.5 mm needles are already doing a great job.